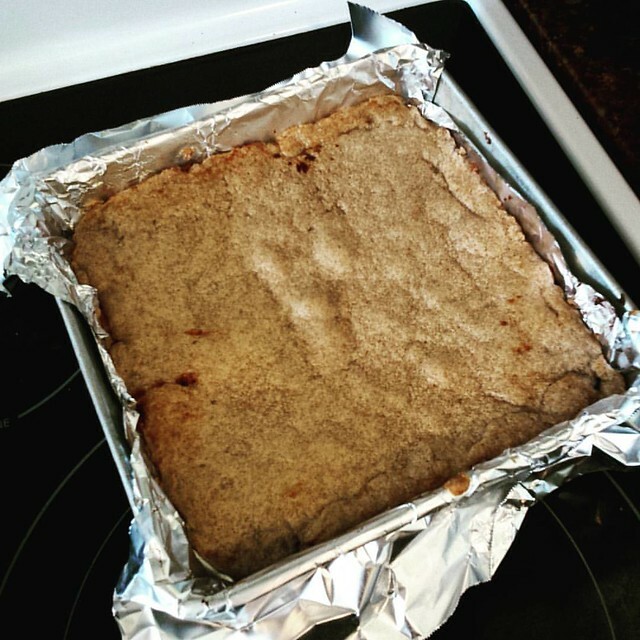 Date - Fig Bars | What Smells So Good? Perusing my archives, it's definitely clear that I have a soft spot for figs. Not only did I whip up three variations of my long-standing favourite cookie, but I even worked them into an elegant braided challah that my mom still talks about. The one thing I hated about making those cookies was how finicky rolling and sealing the dough could be - and since I'm lazy the time to roll out, fill, trim, roll and cut is just not my cup of tea. Bars, however, are a-OK: Less mess, less individual cutting, and far easier storage. When I came across a fig-filled bar cookie in my review copy of Bake Something Great, I knew I wanted to try it out. Unfortunately I didn't have stellar results the first time around, but I picked up enough tips along the way to turn my next pan into a vegan, filling packed, whole grain success. I was running short on the namesake figs by the time I got to baking, but luckily I had some dates handy. These not only bulked up the mix, but added extra sweetness as well so I could use even less sugar in the dough. I upped the flour, using a mix of spelt and whole wheat, and used shortening and flax to keep things animal free. Finally, after chilling everything down, I got to make my first slice - success! 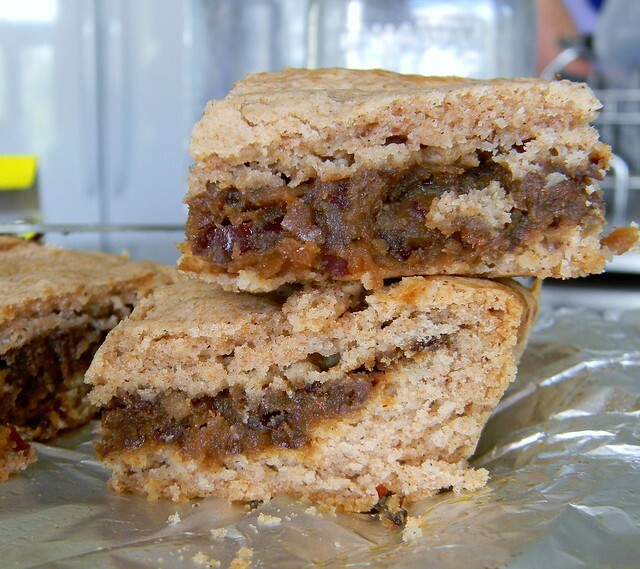 Tons of figgy filling, tender, slightly nutty crust and perfect for packing on a picnic or in a lunchbox. In a saucepan, combine all the filling ingredients. Bring to a boil, then reduce heat to low and simmer, uncovered, until water is absorbed and fruit is soft, about 25 minutes. Puree with an immersion blender or food processor and cool completely. Combine the flours, baking powder, cinnamon and nutmeg. Set aside. In a large bowl, cream the shortening and sugar. Whisk together the flaxseed, water and extracts and add to the butter mixture. Beat well. Gradually add the dry ingredients, mixing just until dough comes together, then shape into a smooth ball by hand. Roll out one half between 2 sheets of waxed paper into a 9” square. Transfer dough to the pan and press in and slightly up the sides, patching tears as necessary. Spread filling evenly over dough. Roll out the remaining dough and place on top of the filling. Trim edges to make an even square that sits neatly in the pan.